Scott’s passion was for flying. He lived his dream every day as the back-up pilot in Newschopper 3. Scott was not only a pilot and a reporter, but an instructor, and one of the most highly respected in the state. 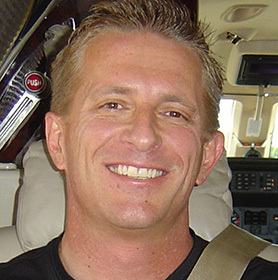 A Camelback High School, Arizona graduate, Scott went on to become the chief instructor at Quantum Helicopters in Chandler, Arizona and was the Manager of Westcor Aviation in Scottsdale. Scott was in charge of maintaining aircraft for Channels 3, 5, 10 and 12. Scott was just as comfortable flying Newschopper 3 on TV, as he was flying Mick Jagger of the Rolling Stones and Jeff Gordon from NASCAR when they came to town. Scott will be dearly missed by his parents, Leslie and Rusty, sister, Amy, brother-in-law, Brad, nephew, Max, and countless friends.